New York is full of great history and heroes. During the fall of 1947, for example, the Friendship Train rolled through the state collecting food for the hungry in war-torn Europe. Today, not far from where the Friendship Train made its New York stops, students at Ithaca College are also collecting donations to feed the hungry. One way they accomplish this is through an online trivia game called FreeRice. Every time you answer a question correctly playing FreeRice, ten grains of rice are donated to the UN World Food Programme. And the Friendship Train is one of the questions in this game! Ithaca College has a dedicated organization to fighting world hunger called Food for Thought. Back in 2010 I wrote a story on Elizabeth Stoltz who founded this hunger-fighting group. Stoltz had set up an event for the Ithaca community called the Walk for Plumpy’nut, a fundraiser to provide life-saving food to malnourished children. This event has continued ever since collecting thousands of dollars each year to purchase Plumpy’nut. She was also running a magazine called Plumpy’nut Press. Since that time Food for Thought has expanded its reach in feeding the hungry. In addition to the annual Walk for Plumpy’nut it has started the Rise up for Rice challenge using the FreeRice game. Two of Food for Thought’s current officers, Lethia McFarland and Lindsey Smith, recently shared some of the groups accomplishments in the following interview. Who developed the idea of the Rise Up For Rice Challenge? 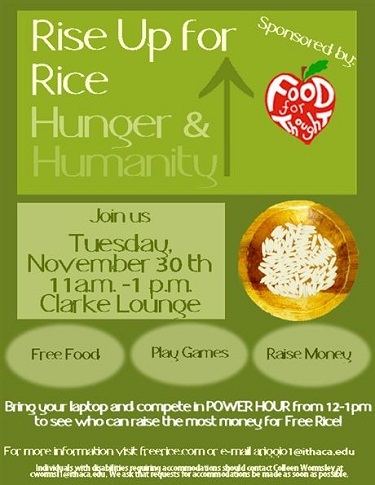 Amanda Riggio, former Food For Thought member and Ithaca College student, conceived an event, “Rise Up for Rice,” where students could gather together and answer trivia questions at freerice.com to help eradicate world hunger. How many players participated in the Rise Up For Rice Challenge this year? Unfortunately, we cannot measure the number people participated this year, given that many people did so remotely, but we did raise 43,590 grains of rice collectively. Did you have a tournament involving different teams too? We did not. Everyone who participated logged in under the same account “riseupforrice,” so that we could best track the impact. How many grains of rice did you raise this year? How did you promote the event on campus? We actively promoted the event via social media, including Facebook and Twitter. To supplement this, we also designed small pamphlets and distributed them throughout campus. Do you have members participating from outside the campus? It could have been a possibility, but unfortunately, we could not measure that affirmatively. Can people still take part in Rise up For Rice all year long? Yes! We encourage students to play on the day of Rise up for Rice, but the account is open all year long. Rise up for Rice was preceded by another event on campus called Walk for Plumpy’nut? How did that event go this year? At our 6th Annual Walk for Plumpy’nut on Sunday, October 7th, we welcomed 109 people and walked together in solidarity to fight childhood hunger. We were able to raise over $4,100 dollars, as well as obtain 40 sponsors for this year’s walk. All of the proceeds will go directly to Concern Worldwide to buy Plumpy’nut for distribution in therapeutic feeding centers across Ethiopia. Plumpy’nut, a ready-to-use therapeutic food, will be used to help treat severely malnourished children. Overall, we hosted a successful event, thanks to the gracious support of the Ithaca community. Article first published as Ithaca’s Food for Thought Takes on Global Hunger on Blogcritics.